This paper tries to define agile governance as adaptive, human-centred, inclusive and sustainable policy-making, which acknowledges that policy development is no longer limited to governments but rather is an increasingly multi-stakeholder effort. It is the continual readiness to rapidly navigate change, proactively or reactively embrace change and learn from change, while contributing to actual or perceived end-user value. This paper fist defines agile governance and tries to explore methodological frameworks that can fit this concept. To this end, systems and design thinking are two methods that have demonstrated their capacity to tackle complexity, prioritization issues, integrate human-centric views and insights from early prototyping of policies. Moreover, tools for agile governance are also being investigated, including policy labs and regulatory sandboxes. 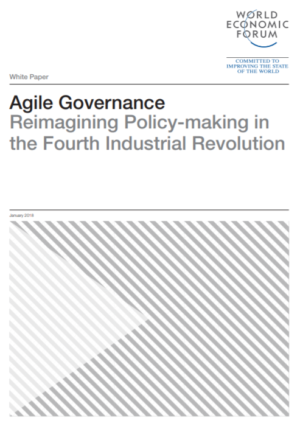 Other methods to reinforce agility refer to the use of technology, promoting governance innovation, collaboration between regulators and innovators etc. It is only through collective and collaborative action, responsible and responsive leadership, and acceptance by policy-makers that public governance, in the Fourth Industrial Revolution, is something that should be a shared endeavour, can we forge a positive way forward.